Compare discounts for Casinos Hotels Motels Resorts in Atlantic City, New Jersey! Located on the New Jersey shoreline, about an hour from Philadelphia and two hours from New York, Atlantic City is the prime vacation destination on the in the most populated part of the eastern seaboard. The 33 million people that visit Atlantic City every year enjoy a host of activities and a unique combination between a beach resort town and a gambling destination. Atlantic city casinos, open 24 hours a day are mostly located along a 4 mile amusement-filled Boardwalk which is the center of activity and provides entertainment for the entire family. Championship golf courses, tennis courts, numerous restaurants and shopping opportunities can also be found all around Atlantic City and the beach. Note: Lists are not identical. 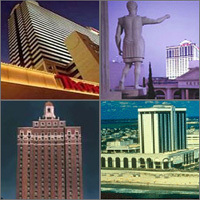 Different sites offer different accommodation options for Atlantic City. The first new Atlantic City hotel in 13 years, The Borgata is Atlantic City's newest resort and casino. The 43-story tower stands as both the largest hotel and the tallest building in the entire state of New Jersey. Caesars Atlantic City is the gateway to ancient Rome. Its marbled entrances and consummate collection of classic sculptures sets the tone for exquisite service and attention to detail. Trump Marina Hotel and Casino covers a 14.6acre tract, overlooking the magnificent Senator Frank S. Farley State Marina. The Atlantic City Hilton is a deluxe hotel located on the beach and Boardwalk in Atlantic City. The Trump Taj Mahal Casino Resort (Taj Majal) is unprecedented in craftsmanship and opulence. Resorts Casino Hotel is Atlantic City first established casino and still offers a complete entertainment experience unlike any other casino/hotel in the area. Towering over Atlantic City's world-famous Boardwalk, Bally's Atlantic City truly is a dazzling destination with an inviting array of activities, award-winning restaurants, an action-filled casino open 24 hours a day, and home to The Wild Wild West Casino and Coyote Kate's Slot Parlor. From east to west, it's the ultimate place to stay and play! The fun begins where the Expressway ends at the award Winning Trump Plaza Hotel and Casino in Atlantic City. The Atlantic City Tropicana Casino Resort is a deluxe atrium style hotel and casino encompassing 3 blocks of the Boardwalk facing the ocean and located 4 blocks from the Convention Center. Full Service Hotel Amenities include: Heated Indoor Pool, Jacuzzi, Sauna & Exercise Room HJ's Cafe and Lounge, Room Service Conference and Banquet Facilities. Located on the Atlantic City Boardwalk the Sands Hotel has 532 beautifully appointed rooms with all of the amenities one would need while visiting Atlantic City. The Sheraton Atlantic City Convention Center is conveniently located directly adjacent to the new convention center, within walking distance of the casinos and boardwalk. Harrah's Atlantic City offers around-the-clock gaming excitement, award-winning dining and superior customer service. The Atlantic Palace Suites is a first class hotel located on the boardwalk between the Sands and Resorts Casinos. The guest suites are clean, bright and spacious, many with ocean views. Every room is equipped with a kitchen and Jacuzzi. The outdoor seasonal pool is refreshing. Howard Johnson Hotel is centrally located on the main strip in Atlantic City. The Beach Boardwalk and a majority of the casinos are within walking distance of the hotel.